Monday February 28th 1898 I did a little sewing in the morning and Will helped me wash after we had an early dinner. Manuel went up to the Hedges place after the rest of the lumber. Tuesday March 1st 1898 It snowed this forenoon. The men could not do much. Manuel went out to see about hiring to John & Ed and to town in the afternoon. I ironed in the afternoon. Willie Anderson was here part of the forenoon. 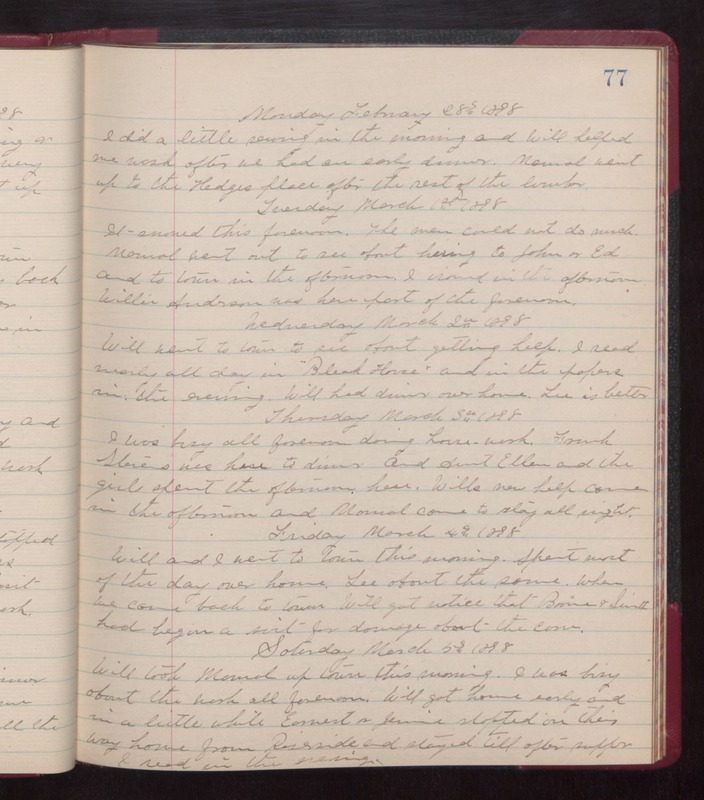 Wednesday March 2nd 1898 Will went to town to see about getting help. I read nearly all day in "Black Horse" and in the papers in the evening. Will had dinner over home. Lee is better. Thursday March 3rd 1898 I was busy all forenoon doing house-work. Frank Stevens was here to dinner and Aunt Ellen and the girls spent the afternoon here. Wills new help came in the afternoon and Manuel came to stay all night. Friday March 4th 1898 Will and I went to town this morning. Spent most of the day over home. Lee about the same. When we came back to town Will got notice that Boone & Smith had begun a suit for damage about the corn. Saturday March 5th 1898 Will took Manuel up town this morning. I was busy about the work all forenoon. Will got home early and in a little while Earnest & Jennie stopped on their way home from Riverside and stayed till after supper. I read in the evening.